Then, after I’d approved the sketches, she did the final full-colour artwork. Pretty awesome! This step is always so exciting, as the story begins to come to life. At this point, you should know what SIZE your finished book will be. In this case, my book was 8.5” x 8.5”. If you’re not sure, just walk around your house and pick up a few kids’ books, opening them up, reading from them, and see what you’re most comfortable with. Probably one size or another will call out to you that’s perfect for your current project. 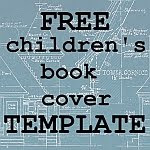 Check with Createspace before having someone do your cover – their size requirements can be pretty specific! Also, if you’re not a professional graphic designer… have someone else do your cover. Perfect! I was in love. I did the back of the cover myself. This part really isn’t that hard (try my free Book Cover Template if you’re a little uncertain!). Plan the way each of your 32 pages is going to look. You can use a page design program, purchased or free. I use Word. You’ll probably get a better look, that integrates the art and the text better, if you use more sophisticated software. But I don’t, and you don’t have to. Here’s the final layout, after playing with it. Notice my copyright page is in here now, along with ISBNs (you can use the free ones Createspace gives you). I’ve also fiddled around with stuff like page numbers and fonts that make it feel more like a “real” book. Now, you’re going to export that humble Word document to PDF format and upload that to Createspace. It’s about to be a book – how exciting! It may take a few tries before they accept it, due to art quality, formatting problems, page numbers on the wrong side (odd on the right!). It can be frustrating to do it over and over again, but worth it for a professional-looking book. Once it’s passed all their hurdles, you need to PROOF your book. And then, proof it again. And AGAIN. Read it out loud! There is no such thing as too much proofing. Ideally in hard-copy, which you have to order and wait for CreateSpace to deliver it to you. There’s also an online proofer, but do NOT rely on this until you have a lot more experience!!! This is the core marketing hub for your book, so plan carefully what people are going to see when they stop by to visit your book. Write a blurb that reflects well on your book, and make sure your cover image is set up properly and looks great. See those stars? A book looks naked without a few reviews… so try to arrange some ahead of time if you can. It’s one step, and it’s easy. This step usually takes me about 10 minutes, back in Microsoft Word. For the Kindle edition, I usually swap out the images for slightly lower-resolution images, just to cut down the file size. I remove all the fancy stuff, like the page numbers and ISBNs, along with fancy fonts, since most Kindle devices can’t display them anyway, So it’s basically just text and art. If you want more control over the layout of your book, you’re going to need to use a tool like Kindle Kids’ Creator. Can’t help you there. Now we’re going to turn the Word document into a Kindle book. This is covered in more detail in the five-step post I’ve linked to here if you need more information. But after a few times, it’s second nature. Calibre (the free program shown above) will create your Kindle file for you. All you have to do is upload it to the KDP (Kindle Direct Publishing) author site… and you’re done! You’ll need to re-enter the same information you did for the CreateSpace book, such as author information, book description, etc. After a few days, once the Kindle version is ready, you can just fire off an email to Kindle support asking them to link the Kindle and print versions. I find that’s easier than going through CreateSpace’s print to kindle screens. But there is more than one way, as they say, to skin a cat. Which would make a GREAT book title… wouldn’t it? More than one way to skin a cat, by… Nah, I’m not turning that idea into a book just yet. Too busy these days. I know I haven’t been blogging much. But I promised a couple of people I’d get this post up, and I hope it’s been a helpful overview of the process, which may seem hard at first but really truly isn’t so tough once you’ve done it a couple of times. It’s actually based on a PowerPoint presentation I put together for my local SCBWI chapter. Even if you’re not hearing from me, I’m still out here. Feel free to drop me a line: Tzivia “at” writekidsbooks.org. I’ll even email back; I try to respond to every email I get, as quickly as I can. Very, very busy these days with life and work and school (yeah, I’m in school full-time right now! ), and I’m even still self-publishing, though at the moment I desperately want to share my first professionally published book with you – maybe I’ll do that in my next post! In the meantime, leave your comments. I love seeing who’s reading and hope you got something out of this! There's a chance you're qualified to receive a $1,000 Amazon Gift Card.